largest auto market, is scheduled to be launched exclusively in China later this year. The ix25 concept hints at a premium look, based on Hyundai Motor's evolved Fluidic Sculpture 2.0 design philosophy. Harmony between a bold front, voluminous side, sporty rear and other details complete the premium small-sized SUV's design. Equipped with a Nu 2.0 engine, the ix25 concept features an overall length of 4,270 mm, overall width of 1,780 mm and overall height of 1,630 mm, while its wheelbase reaches 2,590 mm. "Hyundai Motor has grown into a leading automaker in China through continuous innovation for the past 11 years," said Sung Kee Choi, President, Hyundai Motors. "Hyundai Motor is now poised for a new challenge to become the most-loved brand by Chinese customers, with high-quality models such as the ix25 SUV, which is strategically-developed for China, and the all-new Genesis introduced today." 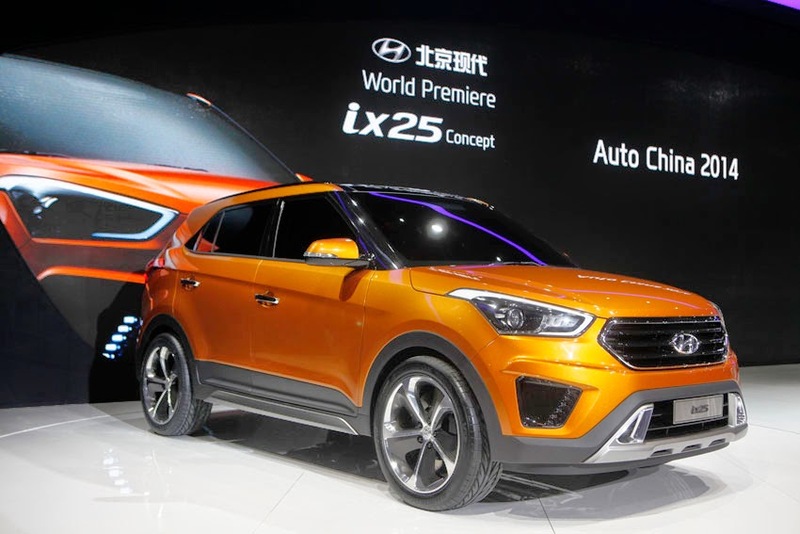 The ix25 will mainly target the young generation who seek style and practicality at the same time, and Hyundai Motor is planning various marketing activities to attract them. With its launch in the second half of this year, Hyundai Motor expects to complete its competitive SUV line-up in China, from ix25, ix35, Santa Fe to Grand Santa Fe, aiming to secure the leading position in the country's rapidly-growing SUV market. The 'i' in ix25 represents the 'inspiring, intelligent and innovative characteristics of the young generation. The all-new Genesis also made its Chinese debut at the show. Equipped with 3.0 GDI and 3.3 GDI engines, the company's rear-wheel premium sedan features its most advanced technologies such as HTRAC AWD system, Automatic Emergency Braking (AEB), Head-Up Display and smart trunk. When it hits Chinese showrooms in the second half of this year, the all-new Genesis is expected to play a key role in enhancing Hyundai Motor's brand image in the Chinese premium segments, together with Equus. Aside from the two new models, Hyundai Motor exhibited a total of 18 vehicles including its i20 WRC car, Mistra, Langdong, ix35, Santa Fe, Equus Limousine and Sonata Hybrid, as well as its new technologies such as the next-generation infotainment system. At a separate booth, Hyundai Motor also displayed its commercial vehicles including Chuanghu, the second production model of Sichuan Hyundai, a 50-50 joint-venture between Hyundai Motor and Nanjun Auto. Developed based on the Trago Xcient, the premium large truck was localised to meet the Chinese market's special needs.